I like this pattern, it’s simple but pretty. What I don’t like is the yarn. 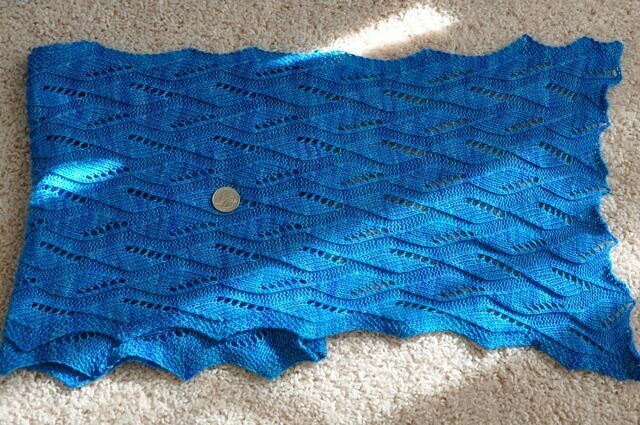 One of my resolutions for 2011 was to knit something with Wollmeise, and this is it. I like the colour and the stitch definition but this skein was a nightmare to work with. Whether I used the inside or outside of the ball, it twisted up so hard it tangled into knots. I hope every skein of Wollmeise isn’t this awful to work with, but from what I’ve seen on Ravelry forums, this is normal for the yarn. I’m really disappointed and will not be buying this yarn any more. There’s a point in a lace pattern, especially where the lace is easy to follow, that you don’t need the chart or directions any more, except maybe on a couple of rows. Once you get there, it’s a fine line between "this is so easy I love it" and "If I have to knit one more sodding repeat I’ll chew my own arm off". Since this was my second Butternut scarf I already knew the pattern fairly well, so I spent most of my time hating the slow progress and wanting it to be over. After 13 repeats, the end was in sight and I ground out the rest in short order. I ended at 18.5 repeats with about a yard of yarn left after the cast off. There was only a little dye run-off in the blocking water. Like last time, I blocked this with wavy edges, pulling out the centre of each almond shape on either side. One cat carefully walked around the towels and didn’t touch the scarf, the other blundered straight towards the lace and got hissed at to go away. Is it at least soft and cushy? Pretty! I like the angled edge. Sadly this is not squishy but stringy. I’m heading into sport weight waters for my next project, and the tosh dk is very squishy. I know that point well with lace….seem to have found it with the princess, although that pattern is wAy to big to memorize. Your scarf at least looks gorgeous!